Peter Greste has been in an Egyptian jail since he was arrested along with two other al Jazeera journalists in December 2013. In June, he, Mohamed Fahmy and Baher Mohamed were sentenced to seven years behind bars after being convicted of aiding the Muslim Brotherhood, which the Egyptian government now considers a terrorist organization. They steadfastly refuted the charges. Last week, the prospect that they could be released from prison was raised when President Abdel Fattah al-Sisi told France 24 that he was considering a pardon for the journalists. We welcome any news and changes of attitude that might lead to Peter being released from prison. However, there is uncertainty and lack of clarity in the latest laws relating to foreign prisoner repatriation. Therefore, we are patiently moderating our expectations. Nevertheless, two things are very clear. 1. Peter has been punished for merely practicing good and responsible journalism. He has not wronged anyone. None of his stories has been discredited. There is no credible evidence against him. 2. Peter was not, will not nor can be a threat to Egypt’s security or national interest. He was in Cairo for a three week appointment. He has no vested interest in Egyptian politics. He did not speak any Arabic. He is not a Moslem. He did not know his work colleagues prior to his arrival. A side note – Amanpour will be hosting the 2014 International Press Freedom Awards, presented by the Committee to Protect Journalists. You can view their work here. Egyptian security forces systematically fired on largely peaceful Muslim Brotherhood demonstrators during the worst spate of violence in the aftermath of President Mohamed Morsy’s removal from power, Human Rights Watch said in a damning new report this week. “The broad accounts that we received largely corroborated each other, and told a story not of a careful effort to deal with the specific threat of violence, but rather a broad effort to simply mow down demonstrators,” Human Rights Watch Executive Director Kenneth Roth told CNN’s Hala Gorani, in for Christiane Amanpour, on Wednesday. His organization says the killings of more than 800 people at Raba’a Square last August likely amount to crimes against humanity. Human Rights Watch calls it a premeditated attack equal to, or worse than, China’s Tiananmen Square killings. Sarah Attia moved to Toronto to offer her family security, after her husband – Khaled Al-Qazzaz – was imprisoned following the military takeover in Egypt almost a year ago. He vanished among many others close to the Morsy government. Until recently, the international community has remained largely silent but a letter smuggled out of an Egyptian jail and published by the New York Times has enabled Al-Qazzaz to question the Egyptian military and the world. Attia talked to Amanpour from Canada and told her that she is haunted by fears of what the article could mean for her husband. "I've been waking up every day since this letter was published, really worrying what could happen to him next." Though she now lives in fear, there came a point when Attia and her husband could no longer stay silent. "We all reached a point where we said enough is enough - we can not sit down and do nothing anymore. 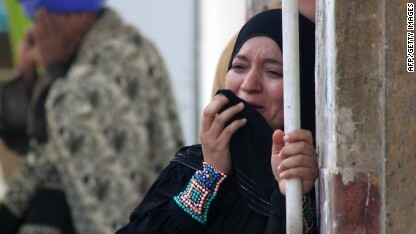 Khaled has been behind bars in Egypt's worst prisons for almost a year now." Sarah and Khaled have four young children. Amanpour asked what they think about why their father was imprisoned. "They know that their father was doing a good thing," said Attia. "He used to tell them that I'm working on making Egypt a better place." Today, Egyptian President Abdel Fattah el-Sisi ordered his interior minister to fight sexual harassment after several women were attacked during his inauguration celebrations. But will el-Sisi's sentiment make a difference? "Definitely", says Hania Moheeb a prominent activist for Women's rights in Egypt and who is herself a victim of sexual harassment. "President Sisi owes a lot to Egyptian women who lined up to vote for him." "I was happy that he spoke about the issue...I think that if he has the will and declared that he has the will then something will happen." Egypt is not “going to elect a dictator,” Former Foreign Minister Amr Moussa told CNN’s Christiane Amanpour on Monday as Egyptians went to the polls. Former Egyptian military chief Abdel Fattah el-Sisi is expected to win the presidency. His comments came in response to a statement by el-Sisi’s sole opponent, Hamdeen Sabahi, that if elected he would release “all the innocent people who were convicted according to this unconstitutional law” – referring to a controversial demonstration law enacted last year. There have “clearly” been consequences for the Russian economy because of the crisis in Ukraine, Christine Lagarde, managing director of the International Monetary Fund, told CNN’s Christiane Amanpour on Thursday. The IMF said Wednesday that the Russian economy was in recession, and is expected to grow by only 0.2% in 2014. “If you look at the monetary policy, if you look at the capital flows, if you look at their own forecast, there have been consequences on the Russian economy as a result of the geopolitical situation, the uncertainty, and the sanctions that have been decided,” Lagarde told Amanpour. In a key sign of international support for Ukraine, the International Monetary Fund approved a $17.1 billion bailout for the country on Thursday. It’s ‘mission impossible,’ Egypt style. Egyptians will go to the polls next month to elect a new president, but the election of former military chief Abdel Fattah el-Sisi seems all but assured. There is only one man who is taking on the task of challenging el-Sisi: Hamdeen Sabahi. “Our Egyptian people [are] used [to] accomplishing mission impossible,” he told CNN’s Christiane Amanpour through an interpreter on Wednesday. 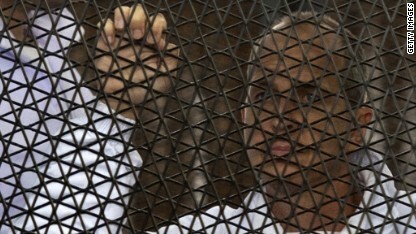 Peter Greste, the Al Jazeera journalist who along with two colleagues has been jailed in Egypt since the end of December, suffered such boredom that reading food labels was his only refuge, Greste’s parents told CNN’s Fred Pleitgen, in for Christiane Amanpour. Journalist Peter Greste has been jailed in Egypt since December. His father says colleagues' support keeps his son going. Monday marked 100 days since Greste and his colleagues were arrested in Cairo. They are charged with collaborating with a terrorist organization, which is the designation the government gives the Muslim Brotherhood. Egypt must reconcile and stamp out violence, Former Egyptian Finance Minister Samir Radwan told CNN’s Christiane Amanpour on Tuesday, while putting the onus for that reconciliation on the once-again-outlawed Muslim Brotherhood. The man who spearheaded the fall of the Muslim Brotherhood President Mohamed Morsy was the very leader Morsy had appointed to lead the military: Field Marshall Abdel Fattah el-Sisi. El-Sisi has now resigned from the military and declared his candidacy for president; elections are set for May 26. He was pictured on Monday riding around Cairo on a bicycle, having traded his uniform for a more populist track suit. “He has opened the door for an inclusive society,” Radwan said. Many, of course, disagree with that statement – chiefly members of the Muslim Brotherhood. Last week, in one fell swoop, an Egyptian court sentenced 528 members of the Muslim Brotherhood to death on charges related to violent riots last August. The people in question were “implicated in acts of sabotage and violent offenses,” Salah Abdel Sadek, chairman of Egypt's State Information Service, told CNN’s Christiane Amanpour. An Egyptian court on Monday sentenced the defendants on charges related to violent riots in the southern Egyptian city of Minya last August, including the murder of a police officer, the country's official news agency said. The riots took place after a deadly crackdown by security forces on two large sit-ins in Cairo, where demonstrators were supporting ousted President Mohammed Morsy. Shadi Hamid of the Brookings Institution tells Christiane Amanpour there is "bloodlust" in Egypt.